We moved into a new house last December. A brand-spankin’ new house. When we were designing the house, we picked one color (a light gray) for our entire interior. This is mostly fine, but sometimes you feel like the rooms are a big ol’ gray blob. And it can be overwhelming to start from complete zero with a new, empty room. Isn’t that an awful before?? I’m embarrassed to even show you this picture. Her bed is up on those cheap risers, the bed skirt is falling off, there’s no focal point in the bed–it just sits there, looking terrible. 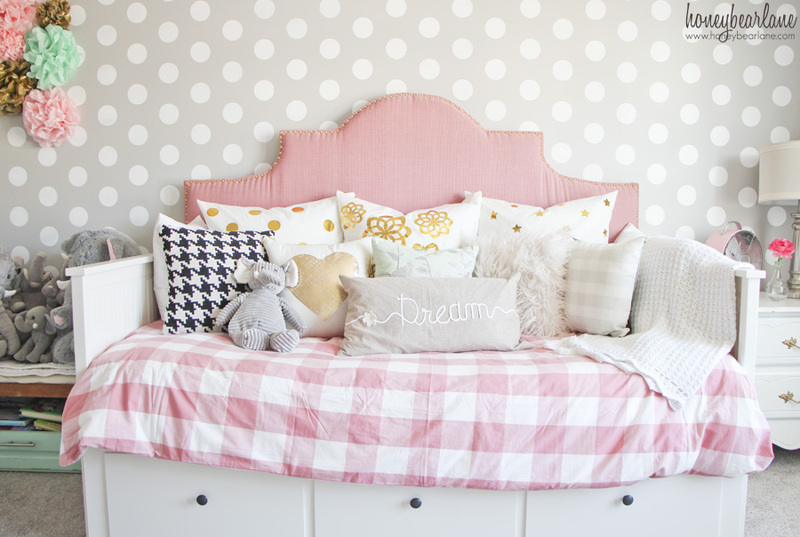 With the daybed, there is a clear focal point and the polka dot wall adds an extra feature. 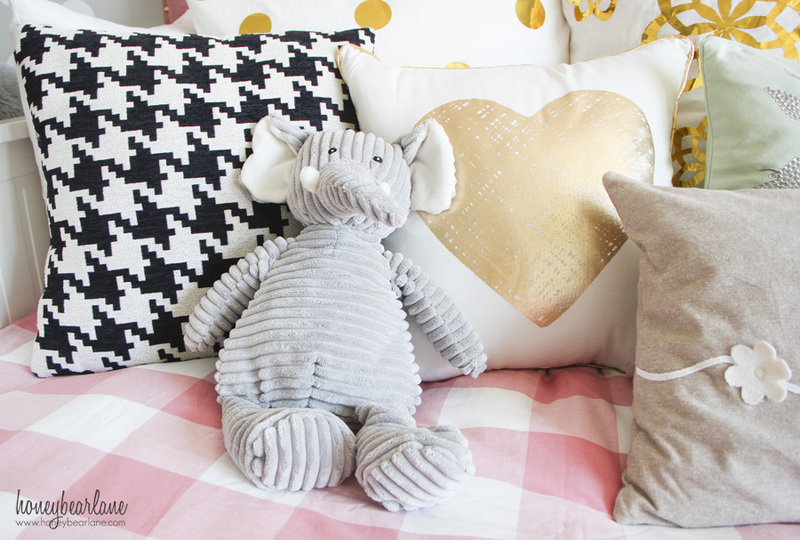 Here are the details on my pink and gray girl’s bedroom! So when it came to my daughter’s bedroom, I have some big plans, but I couldn’t execute them all just yet until I paint the ceiling white. 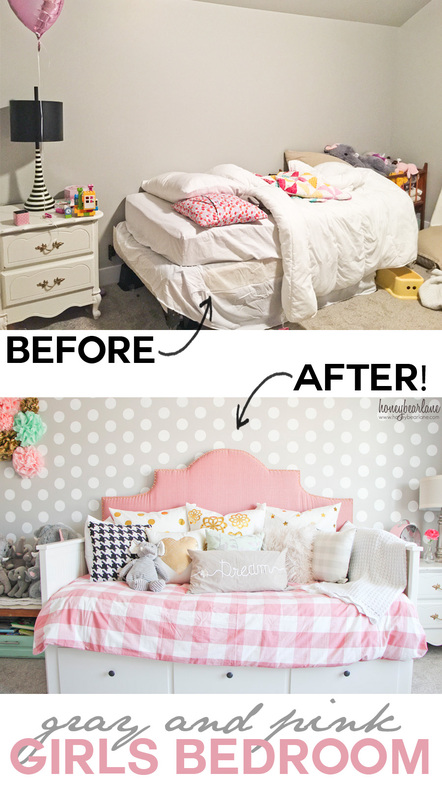 But I did add an accent wall that took the gray blob of a room and turned it into a fun childen’s space. And it really wasn’t that hard–just a stencil! After I stenciled the wall and trimmed out the windows, it was time to put the furniture in place and add all the accents–my favorite part. I made the bed, literally. I actually made the headboard and attached in place of the headboard that came with the bed. This type of bed really needs a lot of pillows. 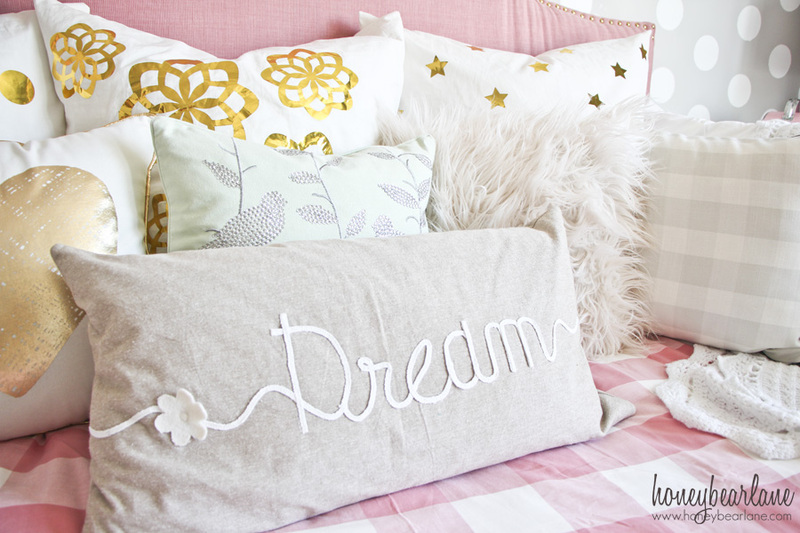 The Euro pillows in the back I added the gold foil vinyl myself. But I love the other pillows as well–the fur pillow, the houndstooth pillow, and the cute gold heart pillow all come from Walmart! Love it when I can find cute stuff when I’m out shopping for groceries. My daughter loves, loves, loves elephants. We kind of brainwashed her to love elephants by always being excited about them to her and giving her endless amounts of elephant stuffed animals. But it’s so cute how much she loves them now and they are all over her room. So I was really excited to find this cute elephant night light for her. One of my favorite accents in this room is the curtains actually. I had some ugly white ones hanging up before with the intention of getting some cute ones hung later. When I found these cute Better Homes and Gardens ones at Walmart I knew they would work great. And they were such a great price–only about $15 a panel! I already had some black out lining panels and I wanted to line these with it so my daughter could get to bed earlier in the summer. The problem was that these came with grommets in them already. 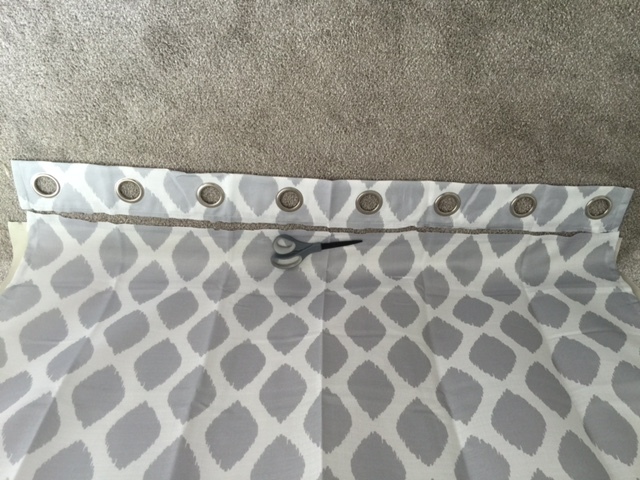 I’m not a lover of the grommet look–I feel like it makes the curtain hang weird and not look as full. There was a quick fix though–I just bought the curtains in the longer length (only $1 more) and bought curtain rings with clips. I clipped the bottom of the curtain to the rings and hung them upside down–but you can’t tell at all. 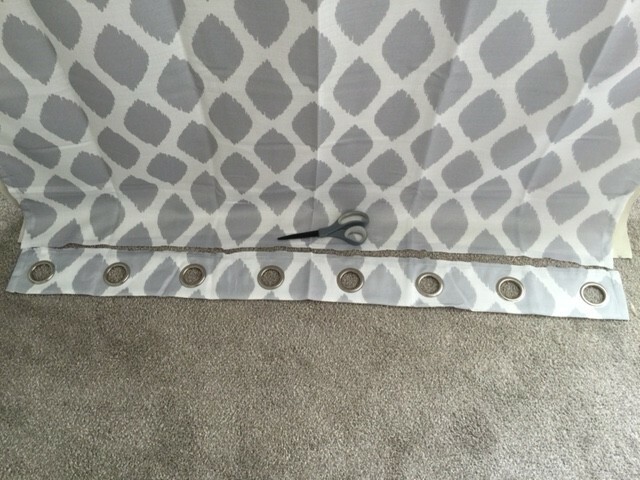 Then I cut the grommets off the curtains and hemmed them. Now they are the perfect length and I clipped the black out panels to the curtain rings, double layered with the curtains. 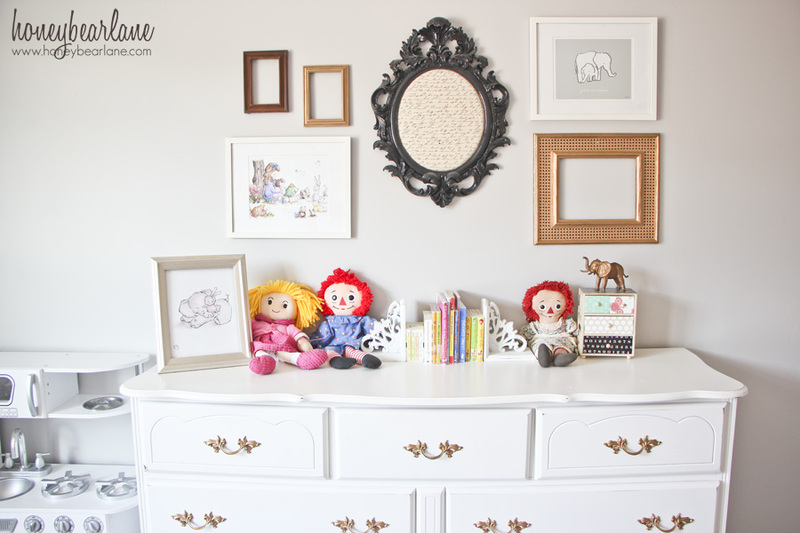 The last thing I want to share is this simple gallery wall above her dresser. It was an easy way to add in some gold accents with the thrifted frames I spray painted. Then I used some white frames from Walmart for the artwork. The entire thing is designed around the beautiful black frame in the middle which helps to ground all the other light colors around the room. There are black, gold, and mint accents around the entire room to give the whole thing interest. Stay tuned for the last little things I’m going to do with her room–a ceiling treatment. When I have time. And can get motivated to paint the ceiling. Note to future builders–get the ceilings all painted white! Saves so much time when decorating. Ha–can you spot my camera lens that I accidentally left in this picture? Love it. 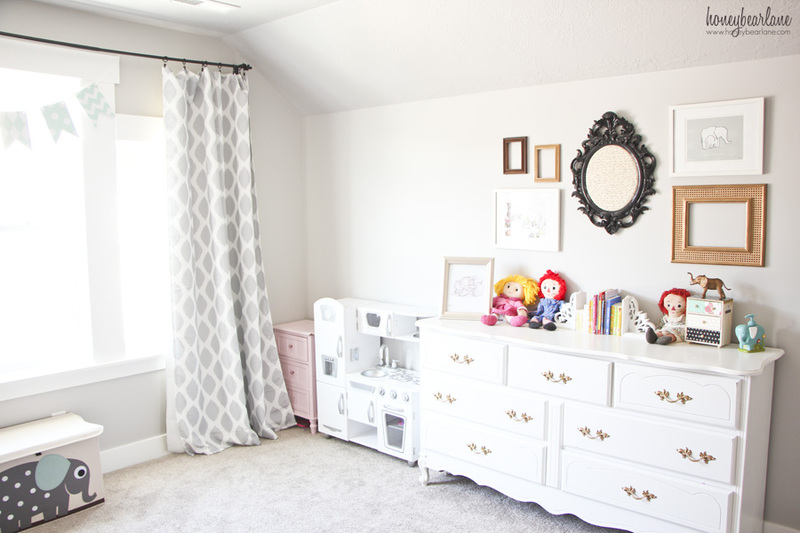 I love that I can take a room from an absolutely drab, boring space to something adorable for my daughter with a little paint, some DIY projects, and some accessories that are totally affordable! 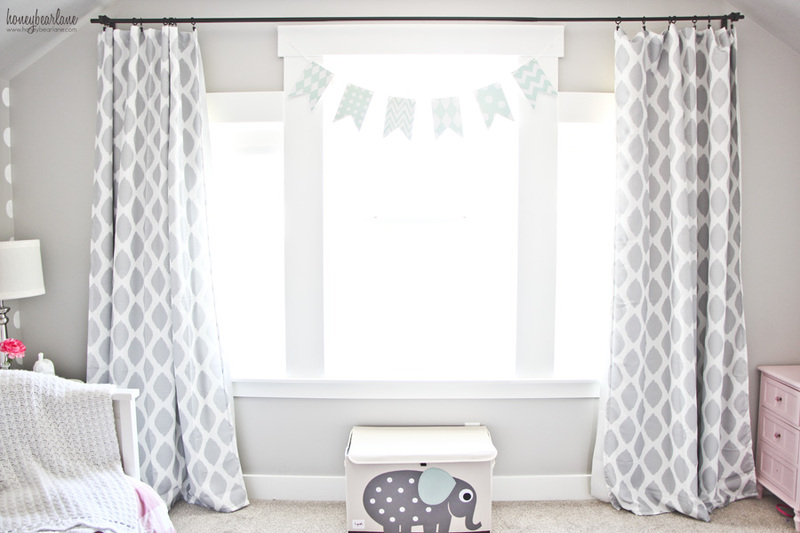 Kids rooms are so much fun to do–I can’t wait to get started on my boys’ room! Follow me on Instagram to catch more sneak previews of upcoming posts! 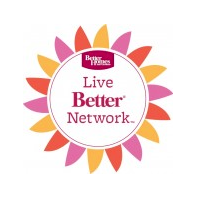 I am a member of the BHG Live Better Network of Bloggers and I received compensation for this post; all opinions are my own. I love it! 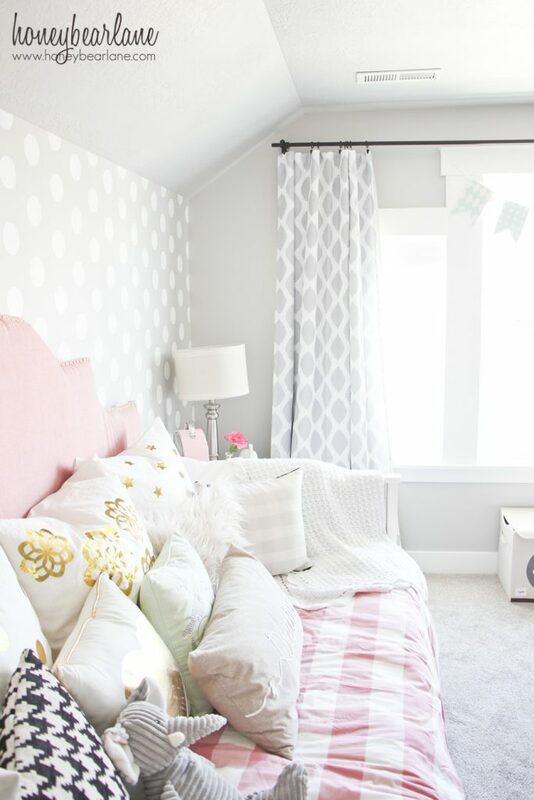 Such a great job on that wall and the pillows! Everything is so pretty!! Love what you did! I love this room so much! 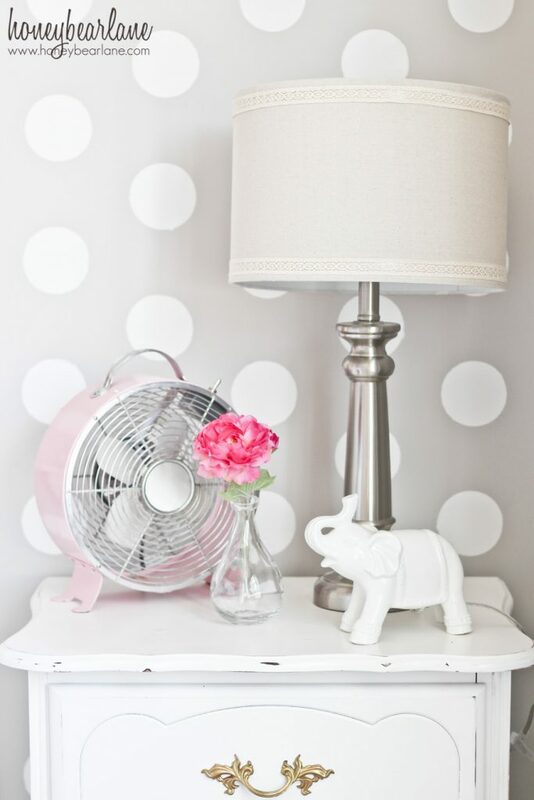 Would you share where you found the polka dot stencil? Thank you! It bought it from Cutting Edge Stencils. Hi Heidi-another question about your stenciled wall- how did you use the stencil- did you tape it on and then paint the dots , what method did you use? 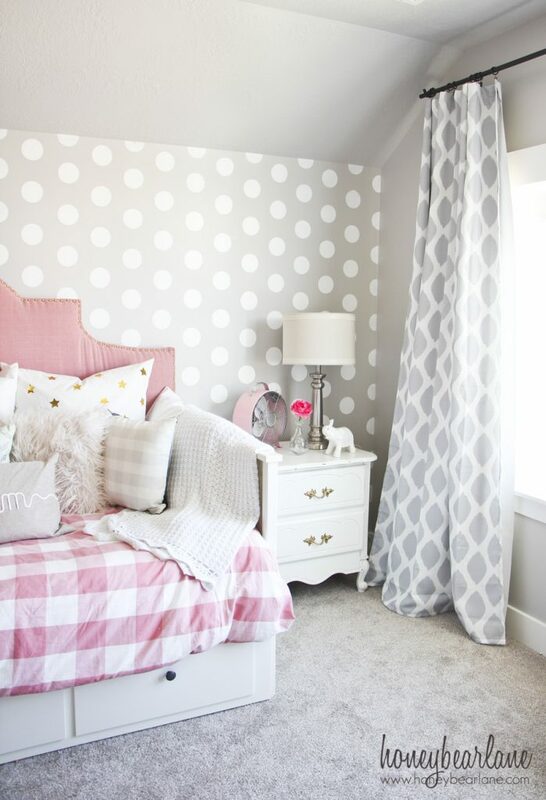 I am about to polka dot on of my daughters walls in her room – any tips? Yes, I taped it over the wall, including some of the previous polka dots I’d already done so it would line up. Use a stippling method, less bleed! What’s the gray you have on the wall please? It’s Sherwin Williams Passive Gray. This is a beautiful transformation! I love the colors that you have picked out. 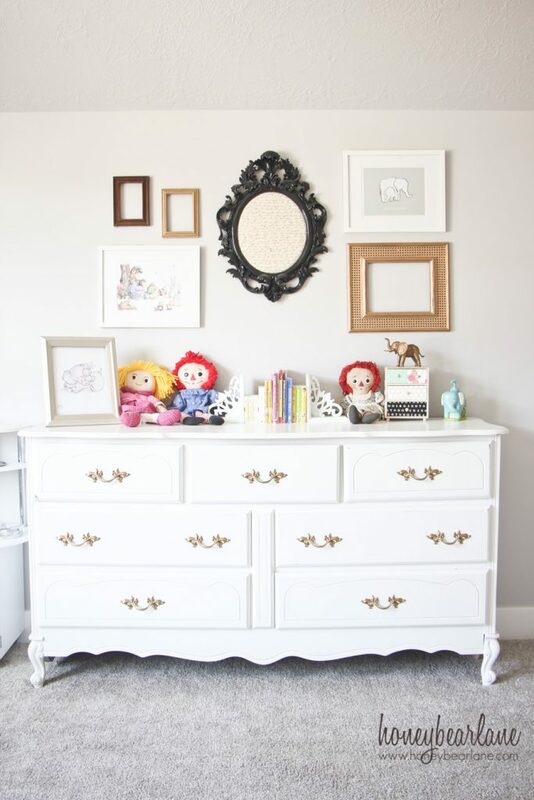 It’s perfect for a little girl’s room!